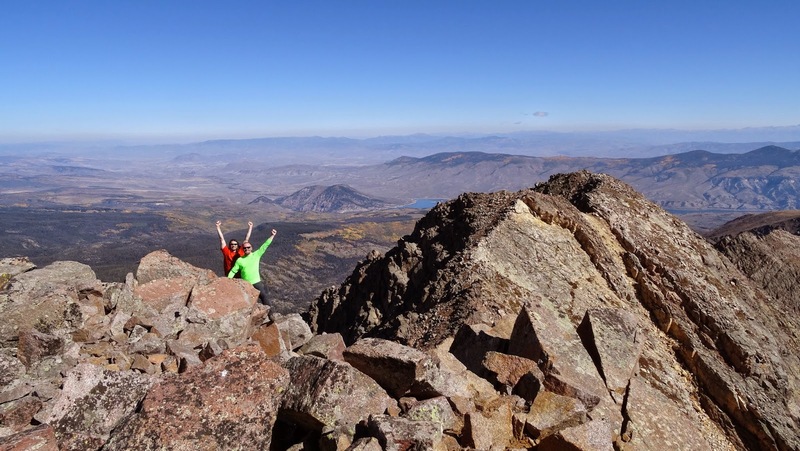 Mission: To summit the remote Eagles Nest Peak (elevation 13,420') as a rarely attempted day hike. Eagles Nest as a day hike? 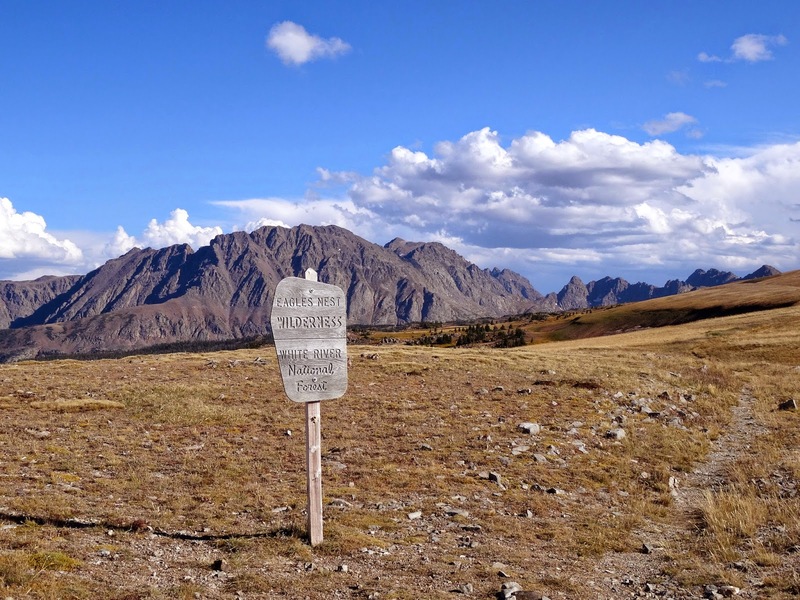 Eagles Nest Peak is a remote peak in the Gore range and also happens to be the northern most 13er in the Gore range. 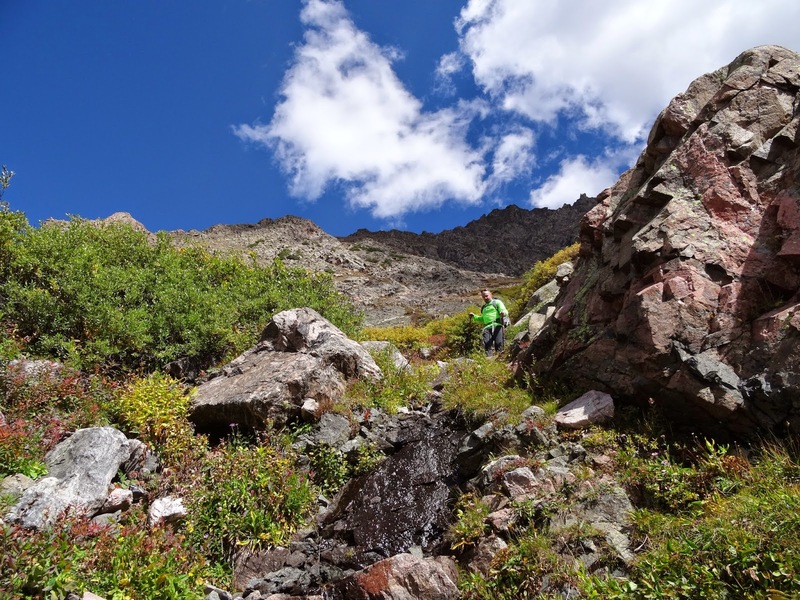 It's usually climbed in a two day excursion, due to the distance required, the off-trail route finding, and the general rugged nature of the Gore range. 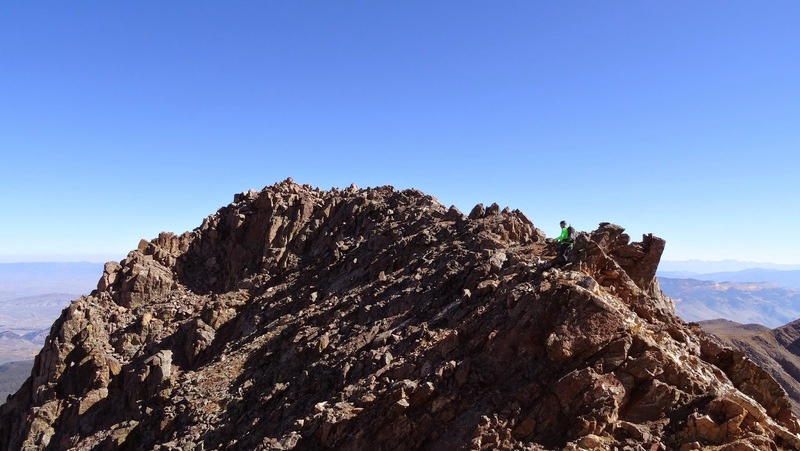 Mark and I had discussed this peak a few times prior and decided to give it a go as a day hike after discussing some route options. We both started this day physically and mentally prepared for a marathon hike. Crescent moon over Eagles Nest. We started our hike just after 3:30am at the Elliot Ridge which is at 11,160'. The highpoint on the approach is just above 11,900' so this ridge makes for a gentle, albeit long six mile approach to where we would drop about 1000 ft. in elevation down to Cataract Creek, before even really beginning our climb of Eagle Nest. The terrain on Elliot Ridge made me think we were hiking in Kansas for a while. In the dark, our headlamps often encountered glowing green eyes, which we assumed were just deer. We covered the six miles quickly and began our descent east into the valley below Eagles Nest just as the day's first light was painting the sky. When the sun came up, the allure of the area we were in was obvious on all sides. Reflections in a pond we hiked by during our descent to Cataract Creek. 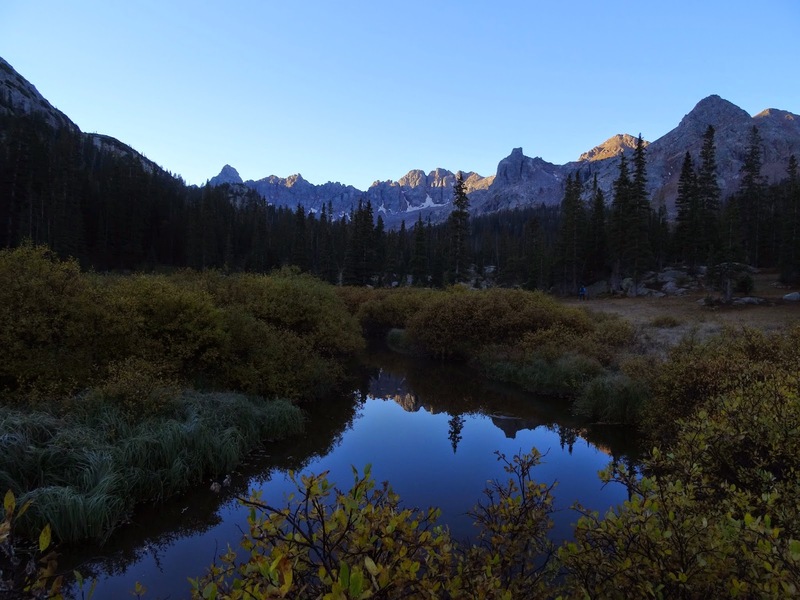 Beauty of the Eagles Nest Wilderness area is in abundance. Mark pausing to take in the sights. Ledges, willows, and scree - Oh My! Mark and I were originally intending to follow a route that was labeled "the south ridge". However, when we left the trail, we headed south along Cataract creek for a bit and we didn't really see where we could gain the south ridge without going over 3/4 of the way to Mt. Powell and without some class "interesting" climbing. 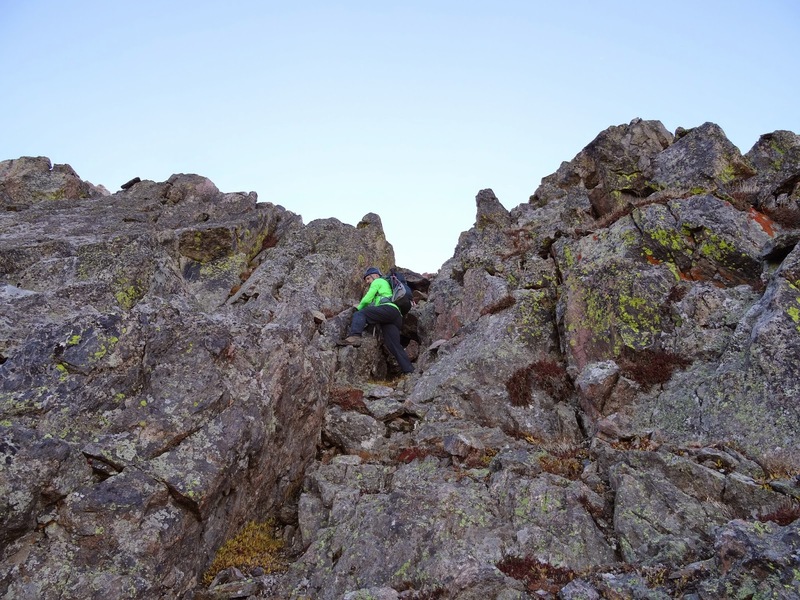 As some seasoned mountaineers in Colorado know, in the Gore range, you have to improvise a route sometimes. We eyeballed what looked to be a steep, but doable class 2+ makeshift route that would eventually land us on the west ridge where the climbing would be class 3. Mark grabbing a quick drink on a grassy ledge. Mark topping out on some class 3 terrain. About halfway up the west ridge, we were both mildly disappointed that the class 3 terrain fades away in favor of a difficult class 2 climb up loose scree, talus, and the optional class 3 move here and there. In my opinion, the class 3 terrain was often the safer route anyway since the class 2 stuff was often loose and rotten rock. We put our heads down and ground out the last 600' or so until reaching the south ridge. The summit is a short walk from where the west ridge intersects with the south ridge. Approximately nine miles from where we started our day seven hours ago, we hit the summit at about 10:30am under clear skies. Upon arriving at the summit, we saw the first person we'd seen all day. This individual was just a tiny silhouette that stood on Mt. Powell's summit in the distance. Views of the Gore Range. This was the second summit that Mark and I shared in the Gore range this summer, with the previous one being Mt. Powell, which we had climbed back in July. While grabbing a quick bite to eat, we searched the summit for a register but could not find one. It was a peaceful day all around, but something was different today. Mark and I both noticed several times just how utterly quiet it was out here. If you stopped walking for a minute, the only sound you'd hear would be a creek, if you were within earshot. If you were far enough from the water, and the birds weren't making a sound, you could literally hear the silence. It seemed that airplanes that flew over didn't even make much noise. While leaving this summit, my heart was content and my mind was peaceful. We had stayed only 20-30 minutes or so on the summit knowing we had a long hike back that included gaining 1000 feet in elevation to get back on to Elliot Ridge. Mark was lingering on the summit for a few minutes while I got a head start on the descent. Shortly after getting back on the west ridge, I knew it'd be a slow descent. My bad ankle had gotten stiff while sitting on the summit, and my body was beginning to feel the exhaustion already. Mark was moving quite a bit faster than me, passed me quickly, and was scoping out the best line down the ridge. Mark identifying the route down the west ridge. We descended to a drainage gully that was different than the route we'd taken up in the morning. Mark was being a great partner in waiting on me and my gimpy ankle coming down the scree gully. This drainage gully ended at a field of willows, which is where some brief hilarity ensued. Mark was walking through some willows about chest high when he took a step, and his entire body disappeared from view. He let out a moderate yell. My initial concern was quickly replaced with laughter when I saw that he hadn't injured himself, but rather had just been swallowed by the willows and some mud. The ground he had stepped on essentially post holed him down about 2 feet. Quite the funny sight, as all I saw was his head disappear and the willow bushes around him shaking. Me nearing the bottom of the drainage and entering willow country. Mark recovered from his humorous willow post-hole incident. Shortly past these willows we were back at a marshy area that I can imagine would be pretty ugly to have to hike through in the spring. Mark looking back at Eagles Nest Peak. The hike back up to Elliot Ridge was slow, and seemed longer than the same trail we'd hiked earlier this morning. Upon arriving back near the top of Elliot Ridge, the good news is the elevation gain is mostly done. The bad news is we had six miles of hiking through territory that resembled Kansas. Mark and I made the best of it, exchanging stories, making wisecracks, sharing aspirations for other peaks we'd like to do, and dreaming of food. Fall colors in effect, winter is coming. I was having some problems with my ankle, and Mark with his knee, so we stopped for one 20 minute break where we just laid down in the grass and enjoyed the silence, the views of the now very distant Eagle Nest Peak, and just enjoyed the moment. Getting going again wasn't that tough since we were now motivated by hunger. About two miles away from the trail head I ran out of water and was now motivated by thirst too. Mark eventually ran out of water too, after sharing some with me. Upon cresting the hill and seeing Mark's truck, I was overcome with a huge sense of accomplishment. This was the longest day hike I had ever done at 18+ miles and we finished in under 14 hours. I'm fairly certain I wouldn't have been able to complete this without my great friend Mark. He has never had doubts about my determination. He's always got a great sense of humor. He's also open to hearing my crazy hike ideas that often involve serious sleep deprivation, or some other element of suffering and often he contributes his own crazy ideas too. After our hike, Mark and I went and had some wings and a pizza at the Boatyard in Frisco. As Mark and I were eating, I was thinking that the first two hikes Mark and I had were miserable failures. 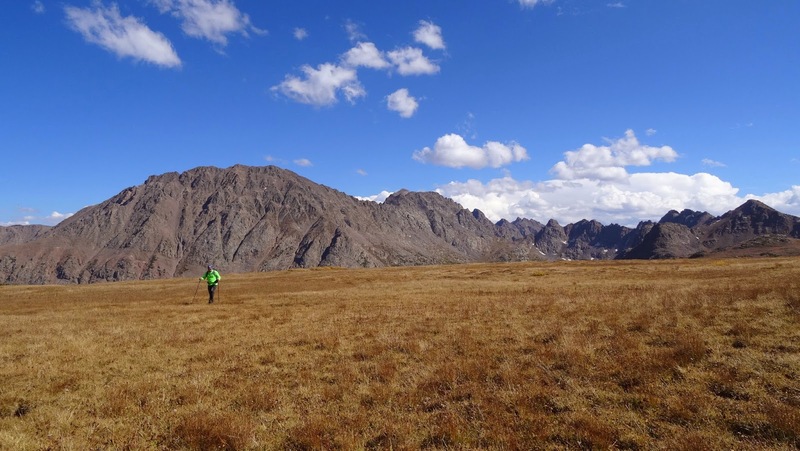 One ended with a turnaround on La Plata in winter where we never even broke the tree line, and the other was a turn around on Blanca at 12,200' because I was having a bad ankle day. Most climbing buddies would probably have just not hiked again with a dude like myself due to the ankle problems I have. Mark never even thought of it, even after a 3rd mountain in which I failed to summit (Cathedral Peak). That's the difference between your basic climbing buddy and a true friend. Two friends and a now trademark summit shot with the short guy appearing taller than the tall guy. This tradition began on Navajo Peak earlier this year.